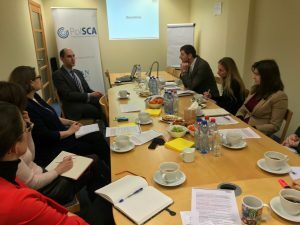 On Tuesday, February 12 at at 9.30 am in PolSCA office, the next meeting with an expert, devoted to the theme of disinformation, for representatives of Polish regional offices and Polish economic organizations in Brussels took place. 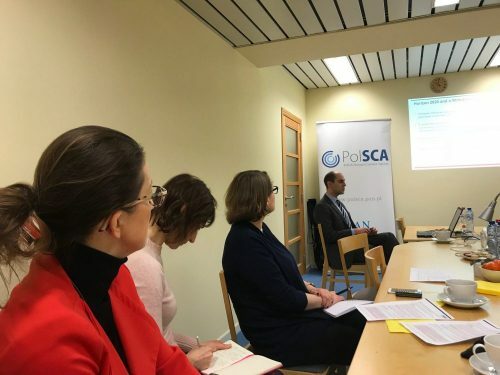 This time we had the pleasure of hosting Mr. Błażej Thomas from the UK Research Organization (UKRO), who as European Advisor advises British universities and research institutions in the field of obtaining European funds within Horizon 2020, Erasmus + and COSME programs. 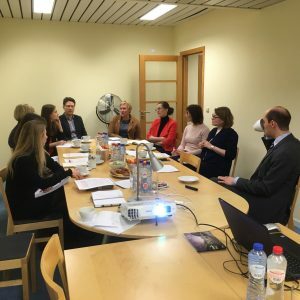 In addition to the presentation of the UKRO profile, the issues discussed included withdrawal agreement, no deal-scenario or British payment guarantee for applicants in European Union programs. All these matters are extremely important for European researchers and scientists, due to the fact that Great Britain coordinates about 20% of projects in the Horizon 2020. Furthermore, together with the participants of the meeting, we talked about economic cooperation between regions in terms of development of small and medium-sized enterprises, shape of student exchange programs and a new migration policy after Brexit. All interested are encouraged to read the current position of the British government and visit UKRO website, where you can find the most up-to-date answers to questions about the research collaboration with grantees from the UK.